The Russell Cup was a schools football tournament that was keenly contested by schools in the Vale of Leven (and later West Dunbartonshire) from 1923 to 1995. It was a very popular competition and most people in the Vale born up to the mid 1980s will remember it fondly. The cup was originally presented by local journalist James Russell JP. 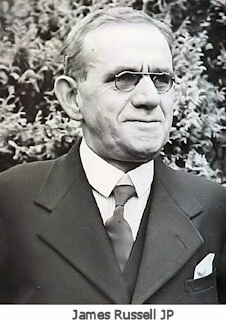 Bernard Boyle and Ronnie James collaborated in the writing of a book detailing its history, which was published in 2003. They have kindly consented to it being made available to everyone via a download from this website (link at the bottom of this page). "By 1923, the first season of The Russell Cup, the school building in Scotland was pretty well completed, with each area having it’s fair share of schools. Many of these would have had, among other things their own football team, with some schools having more than one team. e.g. a team for different age groups or different tournaments and the like. Here was a big recruitment area for not only Scotland, but south of the border as well, with many boys going on from their school team to play professional football. 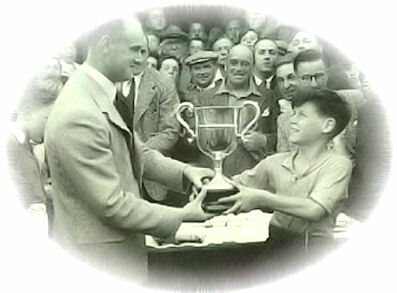 The Russell cup Produced many a good player, with a fair measure of them making a name for themselves on the professional field. Players like Solly O’Hare, Stevie Murray, Brian Gallagher, Ian McColl and many more, all started their playing careers in their local school team. We do well to remember that the Russell Cup was last played in 1995 and the boys involved in that year will still be in their teens today. Some could have just started a career in professional football but most will going out into the world to try and earn a living in other ways. They will be learning things that will help sustain them throughout working their lives. Do you think that forty or fifty years from now they will they still remember playing in the Russell Cup?. The answer would have to be yes, and here is an example of why it should be so. In May of 2001 we were standing across from the old school in Jamestown, we were hoping to get a photo or two of the School the way it would have looked in the forties, It was a Saturday afternoon and the road was pretty busy, and as we stood waiting to get across we could see that any view of it would be spoilt by the many modern contraptions surrounding the old building, rubbish skips, modern lamps, portacabins and road markings, even the burglar alarm would have shown any photo to be recent. Just then a man passed and we asked him if this was the original school for Jamestown. He answered, ‘Aye, its been there for over a hundred years, I went to it in the forties’. The Russell Cup was mentioned and his eyes lit up and he stuck his chest out wee a bit and said, ‘I played in it mate, I remember we beat St Mary’s 2—1 but I can't remember what round that was’. He confirmed that this was during the war because he could recall the Clydebank evacuees coming to the school, maybe 1944. We only spoke for a couple of minutes and then he left to attend to a bit o’ business, but it was easy to see that he was still proud of having played in the Russell Cup and the feeling hadn’t waned in over fifty years. This is the real value of schools football, a wee bit pride gained through playing for your school. In a world that measures achievement in pound signs, this is a wee gift and one that lasts all your life. This is the thanks that we owe Mr Tom Cornock, Mr William Cuthrie and Mr James Russell for The Vale Of Leven School boys Football Competition (The Russell Cup) and although as said earlier, the competition was not without its troubles, did it bring a benefit to the Schools in the Levenvalley and surrounding areas? The answer has to be a definite yes!" (Note that this file is almost 8Mb in size.